AN EMAIL claiming to be from Australia Post is currently making the rounds. The email scam provides details regarding a person's online purchase and claims to trying to organise the delivery of a package. But the email actually contains malicious software (malware) which is loaded onto the person's device. 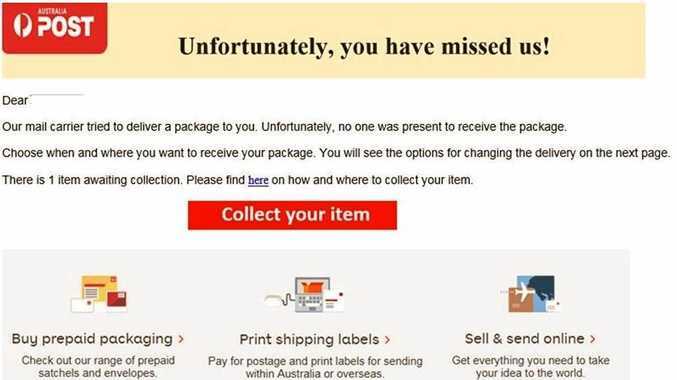 Queensland Police Service has warned that Australia Post will never ask customers to click on an email link to print off a label in order to redeem a package. Neither will Australia Post email or call people asking for personal or financial information including passwords, credit card details, or account information. "Australia Post will never call or email you out of the blue to request payment," a QPS release read. If you receive any suspicious emails like the type described above, police are asking that you do not click on any links or attachments and that you delete it straight away.